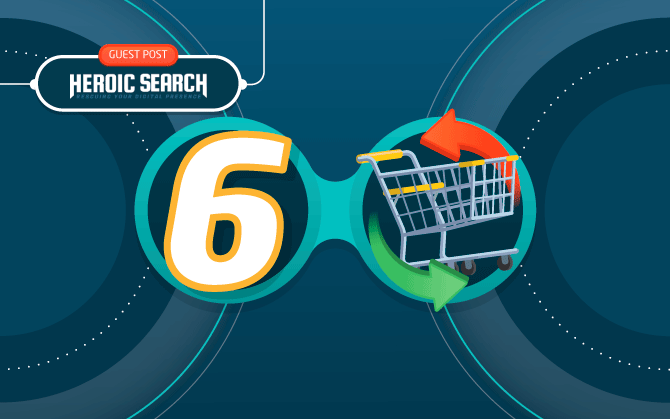 Many are the reasons for people abandoning their carts and failing to complete a purchase on your sales page or checkout. Learn 6 efficient methods to overcome this problem! Online selling is a big deal and more and more of people are becoming online merchants. But while setting up a store and selling products is exciting, there are obstacles to face. One of the biggest is abandoned carts. Research shows that 69% of your customers will abandon their carts. This means that unless you tackle the cart abandonment problem and figure a way to get those percentages down, you’re missing out on almost three-quarters of potential sales. Those are crazy numbers, but the good news is that there’s always a reason for abandoned carts. If you know why your customers are abandoning their carts, you can figure out a way to re-engage them. Let’s take a look at 6 ways to do just that. The first thing you absolutely must do is capture your customers’ email address before they make a purchase. In this way, you can easily retarget them with cart abandonment emails later on. This is really important because 40% of cart abandonment emails are opened, while 50% of them are clicked on. So, entice customers on your website with lead magnets that encourage them to hand over their details. You could, for example, use a pop-up that offers them a 10% discount off their first purchase in exchange for their email address. What’s key is that you don’t ask them to create an account before they make a purchase. 37% of new customers see this as a step too far too soon, and it’s highlighted as one of the prime reasons for cart abandonment. Handing over their email address in exchange for something of value (a discount) is much more of a small commitment. It’s not so much that shoppers are annoyed by high shipping costs. It’s more that they’re annoyed by unexpectedly high shipping costs. If you leave it until checkout before telling them they have to pay a huge shipping fee on top of their item of purchase, it’s going to rankle. In fact, it’s going to make them abandon their cart. Notice the language used in the ad. It’s simple and direct, and free shipping is displayed prominently. The customer who abandoned their cart due to unexpectedly high shipping costs now has a great reason to complete their purchase. You could also use emails to retarget customers with free shipping, provided you’ve completed step one (see above). And if what you’re selling is a digital product, highlight this great advantage: they will get the product in a matter of seconds! By using language like “on All Orders Now” Reef is showing that this golden opportunity to enjoy free shipping won’t be there forever. Urgency is a classic marketing tactic that taps into the customers’ fear of missing out (FOMO). Nobody wants to miss out on an irresistible deal but many of us are willing to bide our time if we think we’ve got time on our hands. If you want your customers to act now and finish off their purchases, retarget them with ads and emails that tap into FOMO. You could even combine urgency with scarcity. For example, if a particular item is almost out of stock, make this known on the product and checkout page. Put yourself in the shoes of your customer: They’ve just made a purchase from you. They’re pretty happy with it, even if they felt it was priced a bit high. Two days later, they get targeted by a rival ad that offers them the exact same product for less money! Buyers remorse then kicks in. Customers want to be sure they’re getting the best deal. Especially in this day and age where they have so many options and can do extensive research, they’re willing to shop around to find the lowest price possible. So offer them a price match pledge. If you can offer to beat any rival price by at least 10%, you’ve got a great chance of improving your abandoned cart percentages and you might create more loyal customers. Sure, you might take an initial hit but it’s those loyal customers that will bring you profits in the long run. If a customer has made it all the way to the checkout page and then decides to bail out, it could be that there are one or two problems with this page. Their experience on the checkout page is absolutely crucial and it needs to flow nicely. 1) Are you offering enough payment methods? 8% of customers abandon carts because their preferred payment method isn’t available. Make sure you know what payment methods your customers prefer and then add them. Also add a POS card reader as it makes the transaction process more seamless, bridges the gap between your offline and online sales, and it also allows you to collect data on your customers. This data then helps you to give them more of what they want in the future. 2) Is the checkout process too complicated? 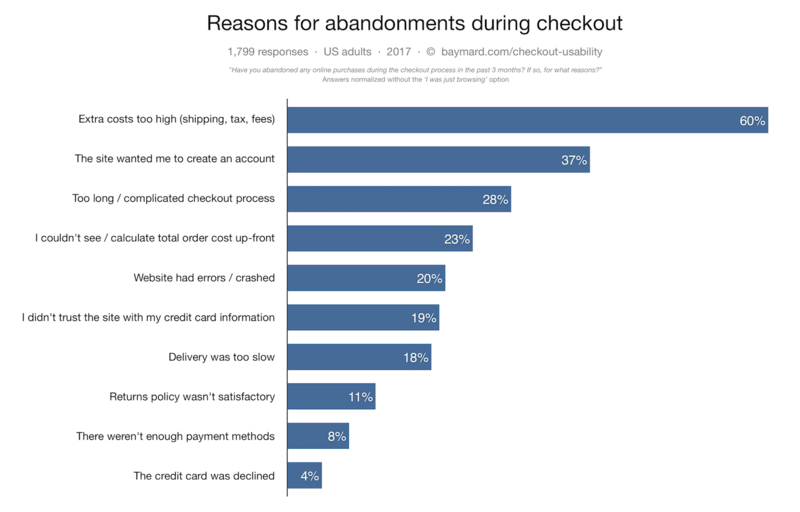 A complicated checkout process is another reason for cart abandonment. If you’re asking shoppers to fill out long forms at checkout, you’ll need to rethink this. If even a guest checkout requires too much information, this will need a rethink, too. Make their life as easy as possible. 3) Is the total amount a surprise? We touched on this earlier in the ‘free shipping’ section. To alleviate this particular concern, add a calculator to each page so that each time a customer adds a new product to their cart, they’re always aware of the total amount at that stage. The last thing they want is to have a total amount in their head – only to find that it’s vastly different to the real total amount once they arrive at checkout. It’s this sense of surprise (or shock) that can lead to abandoned carts. While it seems like common sense that a trust and security seal would increase conversions, it can actually have the opposite effect. Why? Because it reminds the customer that they’re handing over their personal details, which is a big deal. If your trust and security seal seems ‘hidden’, it might decrease conversions. Placement matters so perform split tests to see where you should display it for best results. Experiment with the guest checkout. How much should you emphasize it? Most platforms will let a registered customer checkout as a guest, but you should test whether you should emphasize it over login checkouts. Should you remove your navigation bar from your checkout page or not? Should you remove your live chat service, too? What effect do these ‘distractions’ have on the checkout process? These are 6 ways to re-engage cart abandoners. Combine popups with lead magnets to get their email address as they browse your website. Then, offer more of what they want – free shipping, a seamless checkout process – while tapping into your customers’ fear of missing out with a sense of urgency. Remember, your customers abandon their carts for a reason. As long as you’ve got the reasons and the solutions, you can bring those percentages right down. About the author: Michelle Deery is a freelance copywriter and editor for Heroic Search, a link building agency in Tulsa. You can find her on Twitter. Partner authors who are specialists in a variety of fields!